Slice unpeeled eggplant crosswise into thin slices (1/8 to 1/4 inch thick). Separate broccoli into flowerettes and/or spears. Peel and chop the tender part of the broccoli stalk if desired. If using bok choi, separate the leaves and rinse. Chop any large leaves into bite-sized pieces. Heat oil over medium-high heat in wok. Add chili paste with garlic. (Careful, it will splatter.) Add eggplant and cook for 3-4 minutes, getting all the slices coated with the oil/chili paste. Add broccoli or bok choi, stir to coat. Cover and cook/steam for 5-7 minutes. 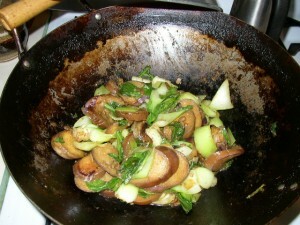 Add yellow bean sauce, stir to coat. Just before serving (when all the vegetables are cooked) add basil leaves. Serve immediately over Thai Sweet Sticky Rice. Makes 3-4 servings.